Our approach to creating fine metalwork involves the marriage of design excellence with exceptional craftsmanship. During the past hundred years these contributions have emerged in several ways. The first four decades were essentially driven by the shear force and mastery of Martin Rose, with significant design input from Paul Fehér, staff artist during the late 1920’s and early 1930’s. 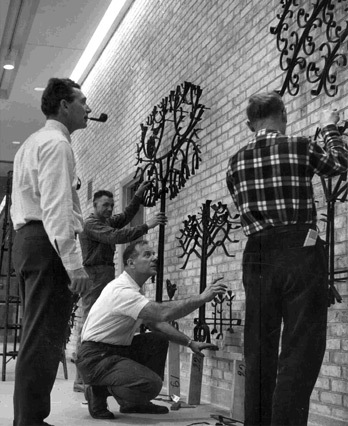 Design responsibility then shifted primarily to Martin’s son Melvin who was trained both in Cleveland and Europe, though brothers Steve and Milton were also involved in designing work. Current work is created both by Rose family members and through our contemporary artist-in-residence program. Since inception, we have also worked in conjunction with some of America’s most outstanding architects, designers and sculptors. It has been our pleasure to work with such noted artists as Viktor Schreckengost, John Paul Miller, Elsa Vick Shaw, Robert Morrow, Fred Vollman and John Risley. Rose Iron Works has been the choice of many of the architects who designed Cleveland landmark buildings. Familiar names include legends such as Charles Schweinforth and Walker and Weeks. Currently we enjoy the friendships of and close working relationships with a variety of prominent architects. Since 1904 our shop has been graced to have attracted several generations of highly skilled craftsmen who have supported all of the artists. 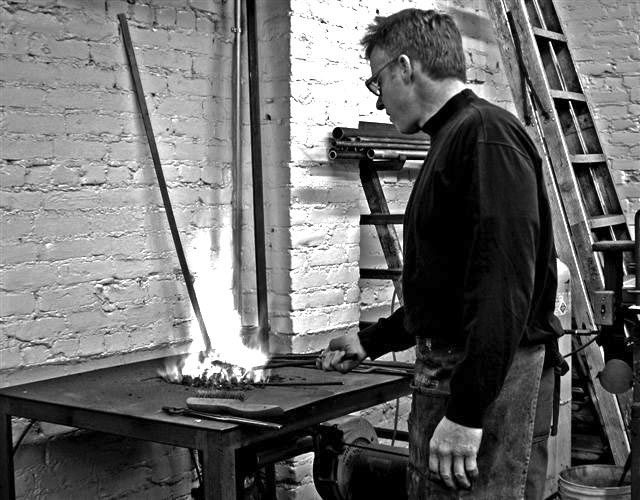 Refined blacksmithing has never been a “lost art” at Rose. Our Artist-In-Residence program is one of the methods used to insure the freshness of our contemporary design. Harking back to the Paul Fehér days of the 1930’s Art Deco period, involvement by non-Rose family member staff designers has been an important component of our design process. America, as well as countries abroad, has benefited from a strong resurgence in the numbers of intensely creative individuals who have chosen to work as smiths. Metalworking, including blacksmithing is now being taught by a growing number of universities and craft schools. Today, we continue our commitment to working with some of the finest artist/designers through our re-established artist-in-residency program. We are intensely proud of the inspiration and craftsmanship provided by these carefully chosen artists.